Today marks the last day in the office for my colleague Ken Combs, who is retiring from his position of (among other duties) Director of Engineering for the RoadRailer product line at Wabash National. Kenny was involved in all the key aspects of the RoadRailer revolution going all the way back to the late eighties and he can rightfully take credit for the perfection of the technology over the years. 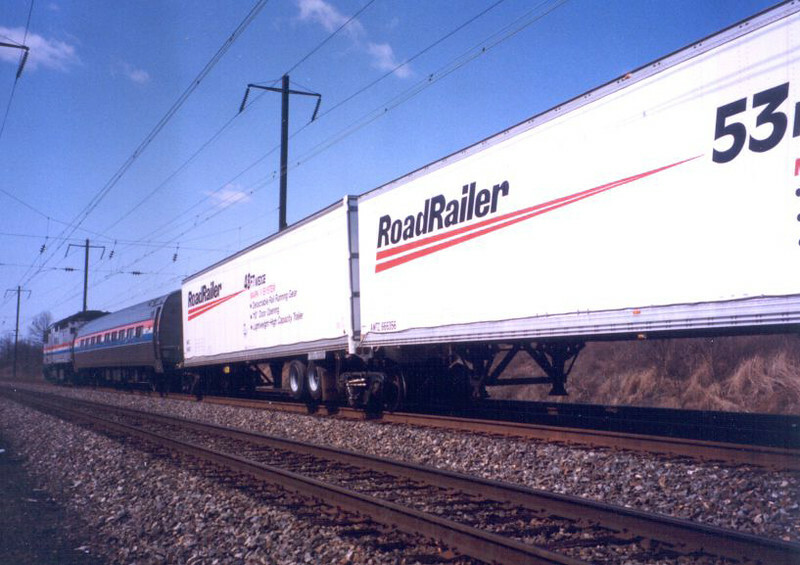 One of his many projects was the application of RoadRailer equipment for the hauling of mail and express on the back of Amtrak trains. Here we see an initial test train circa 1994 near Philadelphia on the Northeast Corridor. The big challenge was coaxing the RoadRailer swing-motion truck up to 90 mph while maintaining stability. This run involved instrumentation on the rail bogies to monitor ride quality at high speed. Note the wiring running along the base rail of the trailers.